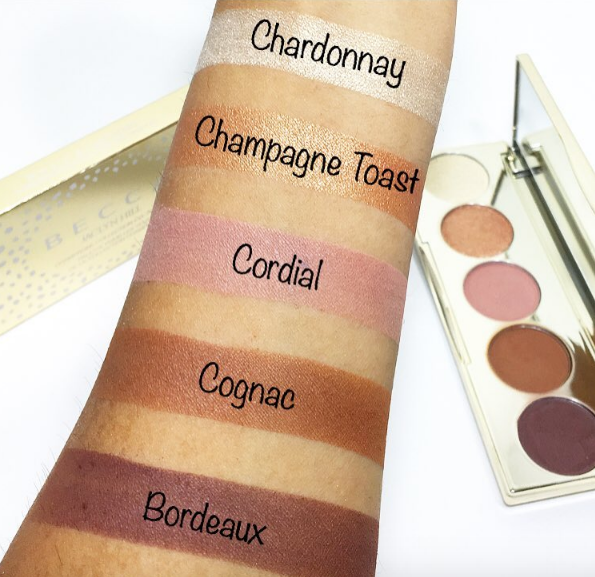 As a gal who adores Jaclyn Hill – as a beauty guru and as a person – I could NOT wait for the Champagne Collection to come out! The products looked amazing and I knew I had to get my hands on what I thought I could make the most of. Below I will be reviewing the Eye Palette which, unfortunately, has been pulled from the collection. I’ll be giving my thoughts on that as well since..well..because I can. 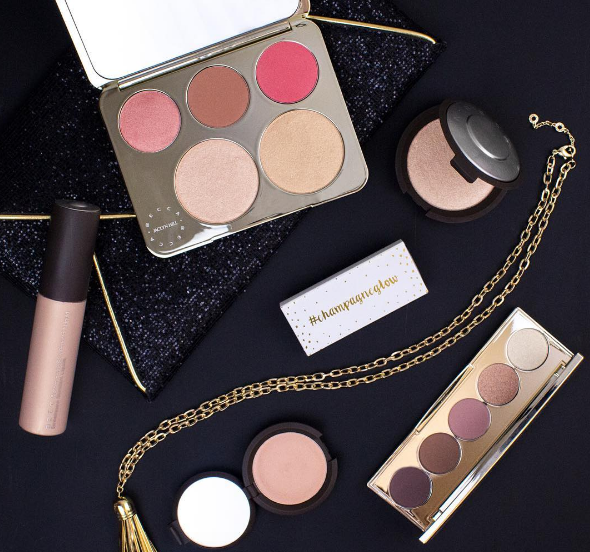 The photo above displays the 4 new products included in the new Champagne Collection created by Becca’s collaboration with Jaclyn Hill. The hype was real and it was insane from my eyes, and rightfully so! Jaclyn Hill is one of my favorite beauty gurus and aside from her mad makeup skills and knowledge, I love how she’s true to herself and follows her own morals and beliefs till the end of the line. If I was able to, I would have bought the entire collection in a heartbeat, instead I wanted to splurge on one of the items and it was between the face and eye palettes. I think the face palette is beyond beautiful but I chose to go with the eye palette because I knew I would get more use out of it. Truth be told, I was unsure of whether or not the blushes would suit my skin. I definitely will be checking it out in stores and most likely will be purchasing it then! Here is a quick shot of the eye palette – I am IN LOVE with the packaging! It screams Jaclyn’s style and looks stunning with the white and gold confetti design! The eye palette includes 5 shades (1.7 grams/pan) and the second one from the left, Champagne Toast, is Jaclyn’s baby. These are some swatches I took and posted on Instagram as soon as I got the palette. This is the first ever Becca product I purchased and honestly, I was slightly bummed when I began to play around with it. I had heard nothing but amazing things about Becca and this palette was continuously described as “super buttery and pigmented”. However, my initial reaction was that it felt like a standard eyeshadow formula I would expect for the price point, nothing insanely amazing. The pigmentation wasn’t lacking at all – but the formula was not super buttery like I had expected. That being said, I pushed this feeling off thinking I had really high expectations, therefore overthought the formula. If you haven’t heard already – here’s what went down recently. 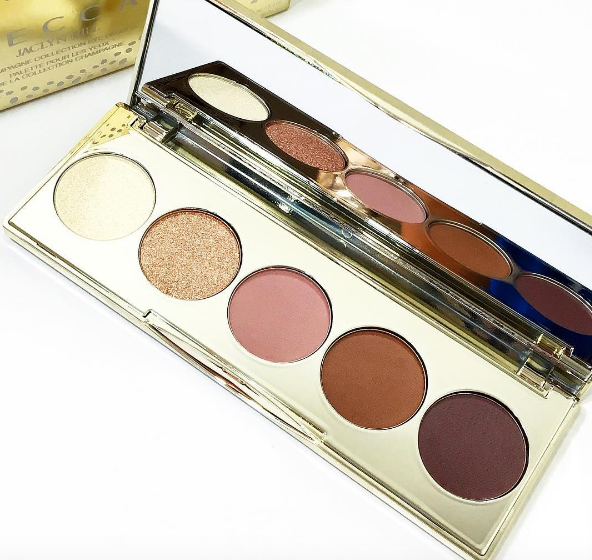 Jaclyn Hill has been receiving comments/concerns about the formula of the eyeshadows and how they were not as described – instead of being buttery and pigmented, some palettes had chalky eyeshadows – not something that is up to par with Becca’s previous eyeshadows. Jaclyn and Becca both discussed this issue and have decided to take the palette out of the Champagne collection – this means the eye palette will not be available to purchase anymore. If any consumers are unhappy with the quality of the palette, Sephora will refund your money! Why do some of the palettes have poor quality? Supposedly, Becca Cosmetics utilized a different lab to create this particular palette, which in turn lead to this issue. There are some articles such as this that speculate the ingredients used in this palette are similar to those used in a drugstore brand. I really don’t know if all the palettes were manufactured in the lab that created the subpar quality shadows or if it was split between multiple labs but it does seem like many people did receive a great quality palette while others did not. Even though this lab issue arose, I’m not totally surprised some folks were not happy with the quality since I have purchased high end palettes that seemed to come from a “bad batch”. Ultimately, I appreciate Jaclyn owning up to this issue the way she did along with Becca. Nothing is ever perfect, mistakes happen, that’s just how life rolls. As for whether or not I’ll be returning the palette – I will be keeping it! I know the formula wasn’t super amazing in my eyes but they do feel like a high end quality I’ve experienced from other brands. I also think it’s perfect for travel since it has shades I can create day and night looks with. Also, I love small palettes and the fact that this one has shades I can use for work everyday without the hassle of going into a larger palette each morning is just heavenly! HOWEVER, I may end up returning it depending on whether or not there’s a big difference in formulation with the other Becca Eye Palettes. I’ll be heading to Sephora when I can to test them out. Hopefully, it isn’t a huge difference! So what I was thinking would not be a huge difference in formulation ended up being a drastic different 🙁 The other Becca Eyeshadow palettes are so much more buttery than the one I have. I’m convinced I got a bad batch which really upsets me because this palette would have been a great addition to my beauty arsenal. However, after testing the other palettes out, it just doesn’t seem right to keep this now knowing what true Becca shadows are like. I have returned this palette but I may pick up the original Champagne Pop highlighter at some point since I still haven’t done so. I love Jaclyn Hill to bits but I’m not sure I’d use the face palette but who knows, if it’s still in stock the next time I go to Sephora, I may end up getting it. Well there you have it! What are your thoughts on the Champagne Collection? If you don’t have everything you want from this collection already, will you be heading to Sephora June 16th to grab any goodies? That's a MAJOR bummer! The eye palette was the only thing I wanted to get. Well I guess I can afford the Morphe 350 palette now. I love the Champagne Pop highlighter. It’s on my wishlist for ages ! Hope to have it soon. Thank you for the review ! What a beautiful palettes ? ?